Epi Week 40 is the official start of the Northern Hemisphere's flu season - and while a pandemic can emerge any time of the year - yesterday the World Health Organization unveiled an Influenza Spotlight webpage on the inevitability of seeing another pandemic, and the work that is being done around the world to mitigate its effects. When 100 passengers on a flight from Dubai to New York in September 2018 fell ill with respiratory symptoms, health officials were concerned that they might be carrying a serious respiratory illness called MERS-CoV (Middle East respiratory syndrome coronavirus) and quarantined the plane until further health checks could be completed. Testing showed that several were positive for the influenza virus, which can be easily spread when people are in close contact or in contained spaces such as airports and planes for several hours. Influenza may not always be thought of by most people as a serious illness – the symptoms of headaches, runny nose, cough and muscle pain can make people confuse it with a heavy cold. Yet seasonal influenza kills up to 650 000 people every year. That is why influenza vaccinations are so important, especially to protect young children, older people, pregnant women, or people who have vulnerable immune systems (click here for a Facebook live with Dr Martin Friede on the flu vaccine). What most of us think of as ‘the flu’ is seasonal influenza, so called because it comes around in the coldest season twice a year (once in the Northern hemisphere’s winter, and once in the Southern hemisphere’s winter) in temperate zones of the world, and circulates year-round in the tropics and subtropics. The influenza virus is constantly mutating – essentially putting on ever-changing disguises – to evade our immune systems. When a new virus emerges that can easily infect people and be spread between people, and to which most people have no immunity, it can turn into a pandemic. "Another pandemic caused by a new influenza virus is a certainty. But we do not know when it will happen, what virus strain it will be and how severe the disease will be,” said Dr Wenqing Zhang, the manager of WHO’s Global Influenza Programme. “This uncertainty makes influenza very different to many other pathogens,” she said. 2018 marks the 100th anniversary of one of the most catastrophic public health crises in modern history, the 1918 influenza pandemic known colloquially as “Spanish flu”. 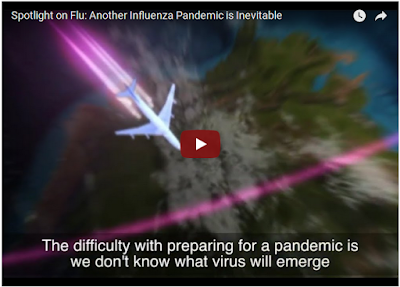 This Spotlight focuses on the lessons we can learn from previous flu pandemics, how prepared we are for another one, and how work on seasonal flu can boost capacity for pandemic preparedness. While influenza isn't the only potential pandemic threat, history has shown it to be the most likely cause. Other viruses - such as SARS, MERS, and even Nipah or Hemorrhagic fevers - have some pandemic potential. And there is always Virus X, the one we don't know about . . . yet. Pandemics vary in intensity, and the last three have proved far less deadly than the 1918 pandemic, which may have killed as many as 100 million people. But there are no guarantees the next pandemic will continue this trend. Two weeks ago, in JAMA: Osterholm Interview - Our Vulnerability To Pandemic Flu, we looked at some of the reasons why a future pandemic could equal or even exceed the toll of the Spanish flu of 100 years ago. 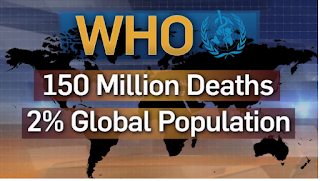 Last May, Johns Hopkins held a day-long pandemic table top exercise (see CLADE X: Archived Video & Recap), which presented a sobering look at a plausible pandemic scenario where hundreds of millions of people could die. If you don't have the time to watch the entire 8 hour exercise, I would urge you to at least view the 5 minute wrap up video. It will give you some idea of the possible impact of a severe - but not necessarily `worst case' - pandemic. Governments around the world consistently rank a pandemic near the top of their disaster concerns, and are working to prepare for an event they consider to be inevitable (see #NatlPrep : Because Pandemics Happen). The first two decades of the 21st century have already been marred by a number of infectious disease epidemics, with 9 of 11 of those kicking off in the past 10 years. Last May, in WHO Handbook: Managing Epidemics, we looked at a 260 page handbook on the 15 emerging disease threats of greatest concern originally prepared for World Health Organization staff. Like it or not, our highly mobile and interdependent world of the 21st century is increasingly vulnerable to the effects of a severe pandemic, something we looked at in some depth last summer (see Supply Chain Of Fools (Revisited)). Like earthquakes, hurricanes, floods, and severe solar storms - pandemics are inevitable. Other than their timing, the only real question is whether we can find the foresight, fortitude, and political will to do something substantial to prepare for them before the next crisis takes that opportunity away from us completely.